To celebrate this new way to play the Yu-Gi-Oh! TRADING CARD GAME, Official Tournament Stores will be hosting Speed Duel Release Celebration events starting January 24 through March 31, 2019! Learn the basics of Speed Dueling, try out the new Skill Cards and win exclusive prizes! Speed Dueling is a great way for new or casual players to get a taste of the Yu-Gi-Oh! TRADING CARD GAME, and is an exciting alternative with new strategy elements for existing Yu-Gi-Oh! fans. Every Duelist who attends a Speed Dueling Release Celebration will take home a bunch of Yu-Gi-Oh! and Speed Duel-branded goods, including an Achievement Card with some challenges. 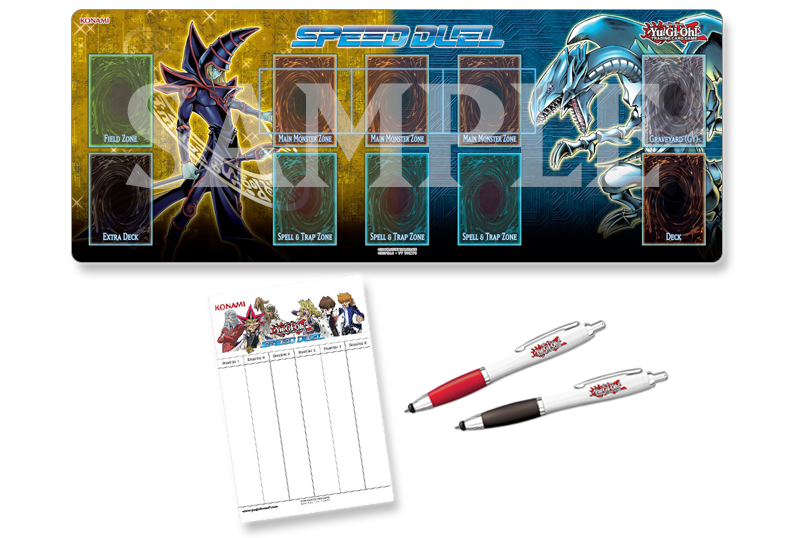 Complete all the achievements for a chance to earn a Speed Duel-branded Game Mat! All items are while supplies last! The Speed Duel format explodes out of the Yu-Gi-Oh! Duel Links mobile game and into the real-life Yu-Gi-Oh! TRADING CARD GAME with a new series of ready-to-play Decks: Speed Duel Starter Decks: Destiny Masters and Speed Duel Starter Decks: Duelists of Tomorrow. The Destiny Masters collection brings together three of the mightiest Millennium Item holders in Yami Yugi, Ishizu Ishtar, and Maximillion Pegasus, while Duelists of Tomorrow unites Seto Kaiba, Mai Valentine, and Joey Wheeler. Each Duelist is represented with their own Deck and three all-new Skill Cards, turning the tables on your opponents with Duel-devastating effects. Rubberized Half Sized version of the Speed Duel Game Mat included in the Speed Duel Starter Decks! These can be earned by winning one of four raffles to be held during the event. Check with your store for details. This card lists achievements for players to complete during a Speed Duel. Perform all the achievements and turn in a completed card to enter a raffle for a game mat. Check with your store for details.